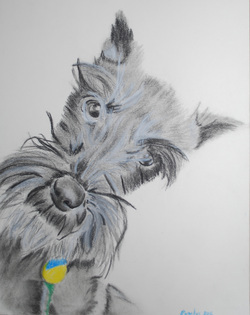 Immortalize your pet with a portrait! I work from your favorite photo* and can even conduct a photo shoot to capture the perfect reference image. Drawings and paintings are typically 8" x 10" on paper and can include the following mediums: graphite pencil, charcoal pencil, pastel and conté crayon. Portraits are unframed. Photo shoots are $50 and finished photos are made available to you on a disk. Prints are an additional cost, and supplied through a professional printer. Large prints and artistic treatments, such as giclée canvas prints, are available. Quotes are provided before purchase. Please allow 4-6 weeks for completion of paintings. Payment due prior to delivery. No deposit. *Please no cell phone photos. If using a professional image, please supply the contact information for the photographer so that I may secure permission for use. Photographs will be returned.